One of the most sought after trails on the planet, 401 doesn’t let down! Flowy, voluptous, shreddy track with SOARING views! 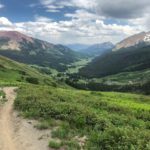 At the top of Schofield Pass, the famed singletrack of the 401 Trail veers right starting with a tough and consistent climb for 1.3 miles through dense trees. Near the top, the grades gets easier, the trees open up, and the views behind you are stellar. 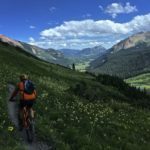 The climb isn’t really all that hard – nothing technically – but your lungs will keep reminding you are at 11,000 feet above sea level. Then the payoff begins. 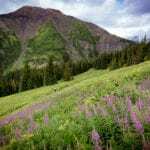 The unsurpassed 360 degree alpine views of the Elk mountains, followed by the first of the steady downhill. 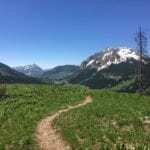 After descending a few hundred feet, the trail flows fast and gently downhill with stunning views in front of you and flowers all around in mid-summer. For much of the top part of the descent you’re hugging the hillside, with a steep drop to the right, which can mess with your equilibrium. There are a few very skinny sections that are easy but have very bad fall potential. Take your time and savor it! VOORMI® is a new to the scene craft apparel brand built around the remote and rugged lifestyle of the Southern San Juan Mountains. Wholly manufactured in the US, and produced exclusively with our own proprietary fabrics, we’re working hard to push the performance limits of fine micron merino for the high elevation backcountry environment of our own backyard.